From Ponca City's Marland Mansion, to Bartlesville's Woolaroc Ranch, Museum and Wildlife Preserve, Highway 60 packs a lot into 70 miles. 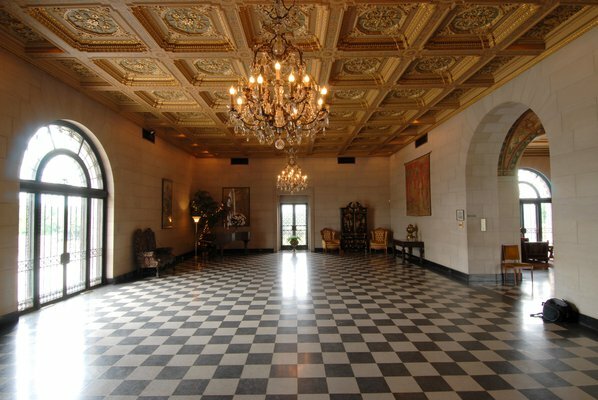 The Marland Mansion's ornate ceiling in the grand ballroom would require more than $2 million in order to be recreated today. The Marland Estates are located in Ponca City. The truly great road trips are not just about the starting and ending points. The scenery along the way can be just as important, and as impressive, as the destination itself. When travelers journey Oklahoma’s newest scenic byway, Highway 60, they are getting the best of both worlds. Beautiful scenery and world-class attractions juxtaposed within the short distance of 70.2 miles make this strip of road a destination unto itself. The winding highway highlights some of Oklahoma’s most awe-inspiring scenery. Starting from Bartlesville and driving west, the scenery changes from green, lush landscape littered with redbud trees sharply turned into tallgrass prairies. Both landscapes are stunning in their own right, and their vast differences are highlighted by their close proximity. As you travel through the tallgrass prairies, Kaw Lake is to the north. The lake boasts 168 miles of shoreline, with recreational activities including fishing, sailing, skiing, hiking, horseback riding and mountain biking, which makes it a very attractive reason to take a detour off the scenic byway. If you do veer off, be sure to return, as there are jewels to be discovered in both of the Highway 60 gateway cities, Bartlesville and Ponca City, as well as in the town of Pawhuska. In Bartlesville, travelers will be delighted with Art Deco architecture that makes this town world famous. Be sure to check out Frank Lloyd Wright’s Price Tower, which is the only cantilevered skyscraper built by the famed architect. You can also view the restored residence of oil baron Frank Phillips, founder of Phillips Petroleum Company, and tour the Phillips Petroleum Company Museum. A visit to historic Johnstone Park is also worthwhile, as it boasts a replica of the Nellie Johnstone No. 1, the first commercial oil well drilled in Oklahoma. If you're looking for a little gaming excitement, check out the Osage Casino just outside of town. Looking like a woodsy upscale lodge, the casino lies in a beautiful setting of rolling hills near pasture where wild horses roam. Highway 60 is sure to meet all your expectations of a quintessential road trip. Perhaps the crown jewel of Bartlesville is Woolaroc Ranch, Museum & Wildlife Preserve. The former country home and hunting lodge of oilman Frank Phillips, this pristine estate is a must-see. To enter the grounds, you drive through two miles of woodland where native and exotic animals such as ostriches, European fallow deer, buffalo, elk and longhorn cattle roam. Visit the former hunting lodge and enjoy sitting in a rocker on the front porch as the millionaire and his family did as they enjoyed the view of the lake and valley below. Also on-site is a world-class museum, which houses an outstanding collection of Western art and artifacts, including paintings by Remington and Russell and one of the finest collections of Colt firearms in the world in its 52,000 square feet. Travelers to Ponca City will marvel at the Marland Mansion, which is a National Historic Landmark and considered one of America’s castles. Once a home to oil tycoon E.W. Marland, it is now a showplace that features an elegant ballroom with a 24-karat gold leaf-covered ceiling that will leave you breathless with its grandeur. This "Palace on the Prairie" was modeled after an Italian castle Mr. Marland admired during his travels. While the tour of the mansion will leave you in awe, the story behind the family that you'll learn along the way is equally intriguing and may just raise an eyebrow or two. When you leave the mansion, go to the nearby Monument Circle to see the Pioneer Woman Statue. Marland was responsible for erecting the statue, which is meant to honor the spirit of the pioneering women who helped settle this part of the country. Adjacent to the statue is the Pioneer Woman Museum, showcasing the contributions and lifestyles of women pioneers from the homestead era to astronauts and civil rights leaders. Also in town are the historic Poncan Theatre containing the world's largest collection of hand-painted lobby art posters, the Conoco Museum, and City Arts Center as well as Standing Bear Park and Museum, celebrating the six tribes located in the area and the famous Poncan Chief Standing Bear. When you pass through Pawhuska, stop for lunch at Bad Brad’s BBQ, which offers good food in a rustic atmosphere. While you’re there, stop at the Osage Nation Museum, the oldest tribal museum in North America. Pawhuska is also known for the Constantine Theater, which is rumored to be haunted. Just outside town lies the Tallgrass Prairie Preserve which is the largest protected area of its type in the country. This 39,000-acre expanse is home to free roaming buffalo herds that are often visible from the road. Whether you choose to stop and explore, or just enjoy the drive, a trip on Highway 60 is sure to meet all your expectations of a quintessential road trip. Take your time. Explore the scenery and enjoy the destination. After all, isn’t the journey at least half the fun?